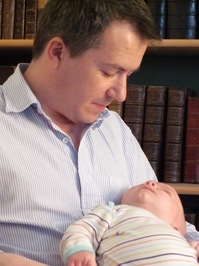 Our Bright Young Collectors series continues today with Dr. John Sellars, of Oxfordshire, England. Sellars collects books relating to the history of philosophy, especially early printed editions of ancient philosophical texts. He has written about his collecting in The Book Collector and has organized two exhibitions of early printed books in Oxford. I was born in Surrey in the south of England and I currently live in Oxfordshire. What did you study at University? What do you do now for an occupation? I studied Philosophy at university and I have been incredibly fortunate in never having had to stop. After ten years as a student culminating in a PhD I have held both research and teaching posts. For a number of years I was a lecturer in Philosophy but now have a research post, in London. Please introduce us to your book collection. What areas do you collect in? In the broadest terms I collect the history of philosophy, with a focus on early editions of ancient philosophical texts, the older the better. I have a particular interest in Stoicism so the Stoics Seneca, Epictetus, and Marcus Aurelius all feature prominently. I have close to 40 different editions and translations of Marcus’s Meditations, dating from 1559 to 2013. I also have early editions of Plato, Aristotle, Lucretius, Cicero, and Diogenes Laertius. As well as these I have a few early editions of works by 16th, 17th, and 18th century philosophers (Descartes, Cudworth, Shaftesbury, Bayle, Diderot), and some modern firsts of 20th century philosophers. 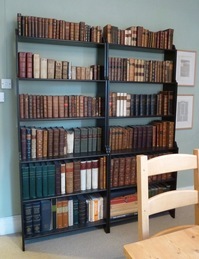 But for me the real, serious collection is comprised of 16th and 17th century editions of ancient philosophers. I also collect leaves from incunabula. I’m fascinated by the early history of printing but complete books from the 15th century are beyond my budget for the time being. Among notable printers I have leaves by Nicolaus Jenson, Anton Koberger, Aldus Manutius, and Johann Froben; I have books by Henri Estienne, Christopher Plantin, the Elzevirs, and John Baskerville, as well as early productions by the university presses in Oxford and Cambridge. How many books are in your collection? In total I have just over 4000 books. I know this because I keep an electronic catalogue that I get printed from time to time. The bulk of these are philosophy books but most are modern academic books and only a fraction can count as part of my serious collection of early printed books. I would guess I have about 100 leather/vellum bound volumes printed before 1800. But the boundary between ‘serious collection’ and ‘working academic library’ has always felt quite blurred. For example I have a copy of Justus Lipsius’ Physiologia Stoicorum printed at the Plantin Press in 1604. Recently I wrote a journal article on Lipsius and spent a lot of time working with this book. I also have a first edition of Wittgenstein’s Philosophical Investigations (1953). I studied Wittgenstein when I was a student but it is highly unlikely I’ll ever write about him or teach him. So in a sense the modern hardback is part of the collection while the four hundred year old quarto is very much in my current working library. What was the first book you bought for your collection? The first major book I bought - the one that felt like the start of a serious collection - was a 1595 edition of the Stoic philosopher Epictetus, bound in vellum. That was the first pre 1800 book I bought and the first one that cost significantly more than a typical academic book. How about the most recent book? As it happens the most recent early printed book to arrive is also an edition of Epictetus, this time a far more modest volume printed in Oxford in 1680 containing Epictetus’ Handbook and the Characters of Theophrastus. It’s not an especially exciting book in itself but it was at a very good price and I like to buy early books printed in Oxford when I see them. 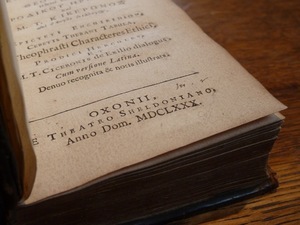 Others that I have include Creech’s Lucretius (1695), Marcus Aurelius (1704), another Epictetus (1715), and Cicero’s De Officiis (1717) - all with the imprint ‘e Theatro Sheldoniano’. And your favorite book in your collection? That’s a very difficult question. One book that I am especially fond of and was perhaps my second serious purchase after the 1595 Epictetus is a 1605 folio of the complete works of Seneca, printed at the Plantin press and edited by Lipsius. In terms of its size, typography, and engravings - it has an amazing engraved title page - it is just a magnificent production. I’ve bought other books since that are perhaps equally grand but I do have a soft spot for this one. It was previously owned by the Seneca scholar L. D. Reynolds. To be honest the majority of the books in my collection have been bargains, primarily out of financial necessity. Among early books, one that stood out at the time was a copy of Thomas Gataker’s second expanded edition of Marcus Aurelius (1697) that I found in Hay-on-Wye. It was in a hideous red library binding and priced at a nominal sum. I’ve since had it rebound in full leather. Even with the rebind it cost me a fraction of the price this book usually goes for. There’s just one small library stamp hinting at its former life. Quite separately I also came across a copy of Gataker’s earlier edition (1652) also in a library binding and now also rebound. But there are other bargains that deserve a mention, such as a complete set of Adam and Tannery’s Oeuvres de Descartes (1897-1910) printed on hand or mould made paper (other copies I’ve seen are printed on flat machine made paper) that a library gave me for free as a bulky unwanted duplicate. I also once acquired a run of old issues of the philosophy journal Mind for free and among those was an issue containing Alan Turing’s famous paper on computer intelligence, which usually goes for a four figure sum. I sold it and bought two 16th century books with the proceeds. I also have a first edition of Quine’s Word and Object (1960) inscribed by Quine to Isaiah Berlin, which I bought for £1. There’s a similar inscribed copy for sale online for £1800/$2200. How about The One that Got Away? I once (and only once) bid on a book at auction. 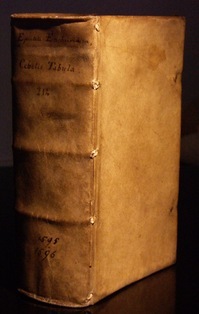 It was the first printed edition of Epictetus’ Discourses (1535), for sale at Sotheby’s. I could just about manage the guide price and bid in advance accordingly. In the end it went for over twice that. Not long after it appeared for sale at a dealer in London, the price doubled again. A month or two later I was it for sale with a dealer in California for more than twice again. By this point it was listed for almost ten times the amount of my pathetic bid. I shall probably never see another copy for sale again, and if I do I doubt I’ll be able to afford it. What would be the Holy Grail for your collection? I’m a big fan of Aldus Manutius, so anything printed by him. Not long ago I was really excited to get my first Aldine book, Cicero’s philosophical works printed in 1541 by his son Paulus Manutius. But really I’d like something by the man himself. Although not a philosophy book, the Hypnerotomachia Poliphili would be pretty hard to beat but that’s never going to happen! Slightly more realistically, any complete 15th century book printed in Italy would be amazing to have. Who is your favorite bookseller / bookstore? Among serious shops and dealers, I’ve bought from Blackwell’s Rare Books, Maggs Brothers, and Unsworths. I also used to buy a lot from the Classics Bookshop (Oxford, then Burford, now moved again under changed ownership). These are all fine institutions but not the places to find bargains, precisely because they know what they are doing! My best buys have been in provincial bookshops and book fairs and of course online, in situations where the seller does not really know what they have. This is quite common with editions of Greek and Latin texts. I also enjoy the treasure hunting aspect of rummaging and finding things in unexpected places. So I don’t have one favorite source. My favorite bookstore is Librairie philosophique J. Vrin in Paris - new philosophy books in French, German, English, Italian, second hand books, antiquarian books, and a publishing house upstairs! What would you collect if you didn’t collect books? As a teenager I collected records. I could be tempted to collect classical music on vinyl, but with the books I simply don’t have the space for anything so bulky. That would be one option. I also have a very small collection of a dozen or so Greek and Roman coins. I would like to have more but given the choice I usually prefer to spend my limited budget on books instead. If I wasn’t buying books I could easily end up pursuing that further. In the broadest terms I collect the history of philosophy, with a focus on early editions of ancient philosophical texts, the older the better. 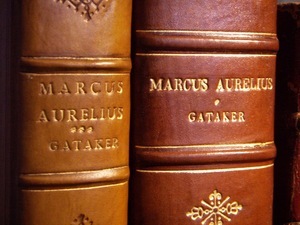 I have a particular interest in Stoicism so the Stoics Seneca, Epictetus, and Marcus Aurelius all feature prominently. I have close to 40 different editions and translations of Marcus's Meditations, dating from 1559 to 2013. I also have early editions of Plato, Aristotle, Lucretius, Cicero, and Diogenes Laertius. As well as these I have a few early editions of works by 16th, 17th, and 18th century philosophers (Descartes, Cudworth, Shaftesbury, Bayle, Diderot), and some modern firsts of 20th century philosophers. But for me the real, serious collection is comprised of 16th and 17th century editions of ancient philosophers. I also collect leaves from incunabula. I'm fascinated by the early history of printing but complete books from the 15th century are beyond my budget for the time being. In total I have just over 4000 books. I know this because I keep an electronic catalogue that I get printed from time to time. The bulk of these are philosophy books but most are modern academic books and only a fraction can count as part of my serious collection of early printed books. I would guess I have about 100 leather/vellum bound volumes printed before 1800. But the boundary between 'serious collection' and 'working academic library' has always felt quite blurred. For example I have a copy of Justus Lipsius' Physiologia Stoicorum printed at the Plantin Press in 1604. Recently I wrote a journal article on Lipsius and spent a lot of time working with this book. I also have a first edition of Wittgenstein's Philosophical Investigations (1953). I studied Wittgenstein when I was a student but it is highly unlikely I'll ever write about him or teach him. So in a sense the modern hardback is part of the collection while the four hundred year old quarto is very much in my current working library. As it happens the most recent early printed book to arrive is also an edition of Epictetus, this time a far more modest volume printed in Oxford in 1680 containing Epictetus' Handbook and the Characters of Theophrastus. It's not an especially exciting book in itself but it was at a very good price and I like to buy early books printed in Oxford when I see them. Others that I have include Creech's Lucretius (1695), Marcus Aurelius (1704), another Epictetus (1715), and Cicero's De Officiis (1717) - all with the imprint 'e Theatro Sheldoniano'. That's a very difficult question. 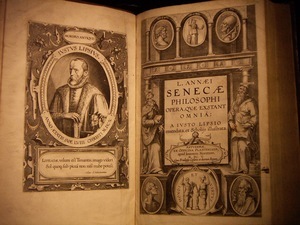 One book that I am especially fond of and was perhaps my second serious purchase after the 1595 Epictetus is a 1605 folio of the complete works of Seneca, printed at the Plantin press and edited by Lipsius. In terms of its size, typography, and engravings - it has an amazing engraved title page - it is just a magnificent production. I've bought other books since that are perhaps equally grand but I do have a soft spot for this one. It was previously owned by the Seneca scholar L. D. Reynolds. To be honest the majority of the books in my collection have been bargains, primarily out of financial necessity. Among early books, one that stood out at the time was a copy of Thomas Gataker's second expanded edition of Marcus Aurelius (1697) that I found in Hay-on-Wye. It was in a hideous red library binding and priced at a nominal sum. I've since had it rebound in full leather. Even with the rebind it cost me a fraction of the price this book usually goes for. There's just one small library stamp hinting at its former life. Quite separately I also came across a copy of Gataker's earlier edition (1652) also in a library binding and now also rebound. But there are other bargains that deserve a mention, such as a complete set of Adam and Tannery's Oeuvres de Descartes (1897-1910) printed on hand or mould made paper (other copies I've seen are printed on flat machine made paper) that a library gave me for free as a bulky unwanted duplicate. I also once acquired a run of old issues of the philosophy journal Mind for free and among those was an issue containing Alan Turing's famous paper on computer intelligence, which usually goes for a four figure sum. I sold it and bought two 16th century books with the proceeds. I also have a first edition of Quine's Word and Object (1960) inscribed by Quine to Isaiah Berlin, which I bought for £1. There's a similar inscribed copy for sale online for £1800/$2200. I once (and only once) bid on a book at auction. It was the first printed edition of Epictetus' Discourses (1535), for sale at Sotheby's. I could just about manage the guide price and bid in advance accordingly. In the end it went for over twice that. Not long after it appeared for sale at a dealer in London, the price doubled again. A month or two later I was it for sale with a dealer in California for more than twice again. By this point it was listed for almost ten times the amount of my pathetic bid. I shall probably never see another copy for sale again, and if I do I doubt I'll be able to afford it. I'm a big fan of Aldus Manutius, so anything printed by him. Not long ago I was really excited to get my first Aldine book, Cicero's philosophical works printed in 1541 by his son Paulus Manutius. But really I'd like something by the man himself. Although not a philosophy book, the Hypnerotomachia Poliphili would be pretty hard to beat but that's never going to happen! Slightly more realistically, any complete 15th century book printed in Italy would be amazing to have. Among serious shops and dealers, I've bought from Blackwell's Rare Books, Maggs Brothers, and Unsworths. I also used to buy a lot from the Classics Bookshop (Oxford, then Burford, now moved again under changed ownership). These are all fine institutions but not the places to find bargains, precisely because they know what they are doing! My best buys have been in provincial bookshops and book fairs and of course online, in situations where the seller does not really know what they have. This is quite common with editions of Greek and Latin texts. I also enjoy the treasure hunting aspect of rummaging and finding things in unexpected places. So I don't have one favorite source. My favorite bookstore is Librairie philosophique J. Vrin in Paris - new philosophy books in French, German, English, Italian, second hand books, antiquarian books, and a publishing house upstairs! What would you collect if you didn't collect books? As a teenager I collected records. I could be tempted to collect classical music on vinyl, but with the books I simply don't have the space for anything so bulky. That would be one option. I also have a very small collection of a dozen or so Greek and Roman coins. I would like to have more but given the choice I usually prefer to spend my limited budget on books instead. If I wasn't buying books I could easily end up pursuing that further.